ST. GEORGE — An earthquake about 23 miles, south-southwest of Caliente, Nevada, and 63 miles west-southwest of St. George, was felt in Southern Utah Friday. Although no immediate damage was reported in St. George, or in Mesquite or Caliente, Nevada, possible structural damage has been reported by Nevada Department of Transportation, resulting in U.S. 95 transition ramps to Interstate 15 southbound and northbound being closed, as well as the MLK on on-ramp to I-15 southbound. Motorists are advised to use alternate routes. Initial reports measured the primary earthquake at magnitude 5.4, but analysts later placed the main quake at magnitude 4.8, University of Utah Seismologist Katherine Whidden said at about 1:30 p.m. MDT. 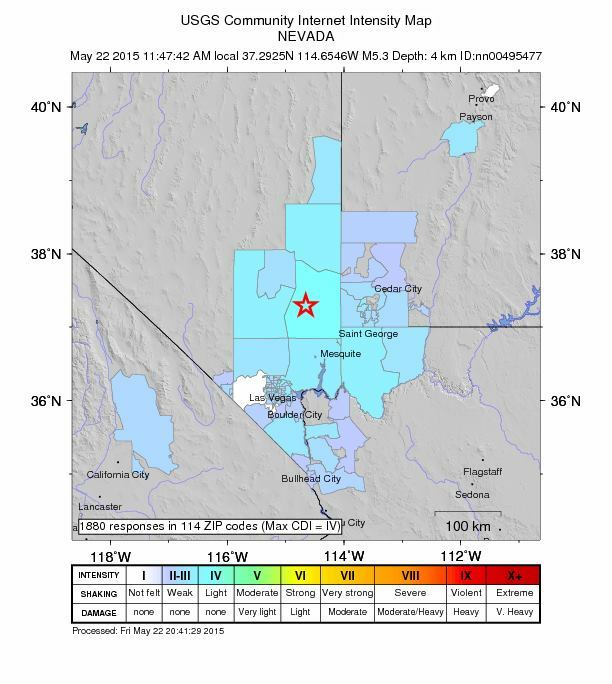 On the other hand, Mickey Cassar, seismologist with the Seismological Laboratory, University of Nevada in Reno said the latest estimate, at about 3:15 p.m. MDT, they are making is 5.28 magnitude. Additional aftershocks may be expected. In the seismology graph below, the main quake can be seen in the color green, with the greater of the aftershocks shown in red, black and blue. The initial quake was felt across southern Nevada, in Las Vegas and Mesquite, as well as in Southern Utah, from St. George to Cedar City, and Hildale. As of 3:15 p.m. PDT, 4:15 p.m. MDT, Nevada Department of Transportation has posted an alert advising that ramps from U.S. 95 to I-15 northbound and southbound are both closed, as well as the MLK on onramp to I-15 southbound. NDOT inspects its 1,100 bridges statewide at least twice a year. All of our bridge structures are designed to withstand rigorous wind and earthquake loading. Nevada lies within an active seismic zone, which is something that we take into account during the project design and engineering phase. Nevada consequently has some of the best rated bridges in the country, according to a recent report by the American Road and Transportation Builders Association (ARTBA). Only 1.8 percent of Nevada bridges are classified as structurally deficient, which is the lowest in the country. There were no apparent impacts on Interstate 15 through the Virgin River Gorge and no rockslides, Arizona Department of Public Safety Highway Patrol Sgt. John Bottoms said. He had been sitting on the side of the road when the earthquake occurred, he said, and felt nothing. Mesquite, Nevada, resident Denise Vaughn said she had never felt an earthquake before and wasn’t sure what was happening. St. George News reporters Ric Wayman and Julie Applegate contributed to this report. University of Utah Seismograph Stations informative booklet, provided here: Putting Down Roots in Earthquake Country. ” An earthquake 39 kilometers south-southwest of Caliente, Nevada” – Freedom units please! “and 63 miles west-southwest of St. George” – ahh so much better. Cool name aside, I prefer metric. It’s a far superior measurement system in every way (particularly mathematically and scientifically). It’s consistent and predictable. This is not very helpful for those of us who travel to Las Vegas and need to know when to plan an alternate route. Are there two, three, or four on-ramps to I-15 closed? Which ones, exactly? For example, it was first reported that the on-ramp from southbound Hwy. 95 onto southbound I-15 was closed. Which other one(s) are closed? What is the estimated time for re-opening? What are they likely going to do to fix the problems (for example the 2-inch space between pavement blocks on the on-ramp I mentioned)? Oh, and also: Were no highway off-ramps affected by the earthquakes? Steve, I appreciate your sharing your frustration, it helps us refine our delivery – it is our aim to make a News LIVE report as clear as possible for you. I’m not sure I understand your confusion about the ramps. NDOT was specific: The ramps from U.S. 95 onto I-15 were closed – at first only the ramp onto I-15 southbound, later the ramp onto I-15 northbound as well. If you are aware of more than one interchange between U.S. 95 and I-15 in Nevada, please illuminate? Please understand that when we publish news LIVE, the report updates with news items in the moment, it is a developing report and depth often comes later. NDOT had not estimated time of reopening when we reported each of the ramp closures – the point was to alert motorists to the closure in the moment. NDOT was appraising damage in that same moment so had not yet prescribed a plan to address what they had not yet diagnosed. Certainly, what NDOT will do going forward is likely ripe for a stand-alone followup story. Again, thank you for the comment and I hope this helps clarify the nature of our News LIVE reports. “The ramp onto I-15 southbound” is not clear, because there are TWO ramps from Hwy. 95 onto I-15 southbound (from Hwy. 95 southbound and from Hwy. 95 northbound). Even if the reporter is not familiar with the area, you can look on a map to understand that there are FOUR on-ramps to I-15 at that intersection. And updates should also be provided. In this case, the damage was determined to be minor and all ramps were back open again at 5:00 pm yesterday.